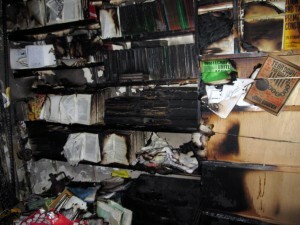 The Melbourne Anarchist Club condemns the recent firebomb attack on Freedom Bookshop in London and extends the hand of comradeship in solidarity. As a gesture of our support at our last meeting it was decided to donate AUD500 to assist in the ongoing repair and recovery of the premises. I spent many a Thursday in there folding, wrapping and posting Freedom Press. The unknown but we can bet Fascists.